McCourt Construction has completed dozens of projects for transit and rail operators in Massachusetts. We are comfortable managing projects on or around active rail lines and bus-rapid-transit lines. Recent projects range from a $22.3M rail accessibility project that included the relocation of 2,500 feet of urban rail lines, to the reconstruction of New England’s busiest bus terminal. 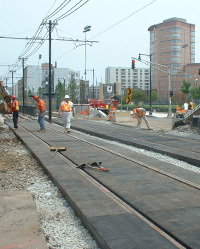 For an example McCourt Construction’s transit experience, please see our project page for the Huntington Ave Project.